Ok folks, here it is, as promised, the "how-to-make-your-own-macarons" post!! First of all, just for the record, these are NOT coconut macaroons. These are French macarons. In my opinion, the perfect pastry. Crispy exterior, soft chewy center, adorable little dome shape.... 100% cuteness! Believe me, you can do this. I am not a pastry chef. I don't own any fancy equipment. This is NOT hard to do! You just gotta try it! 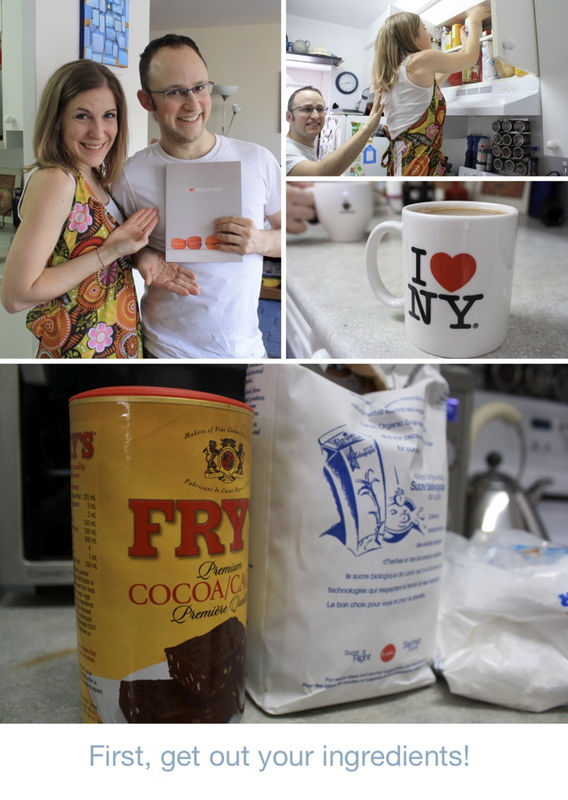 Last weekend, my friends Lee & Andrew wanted to learn how to make macarons, so I thought, what a perfect opportunity to make a macaron post for my blog! 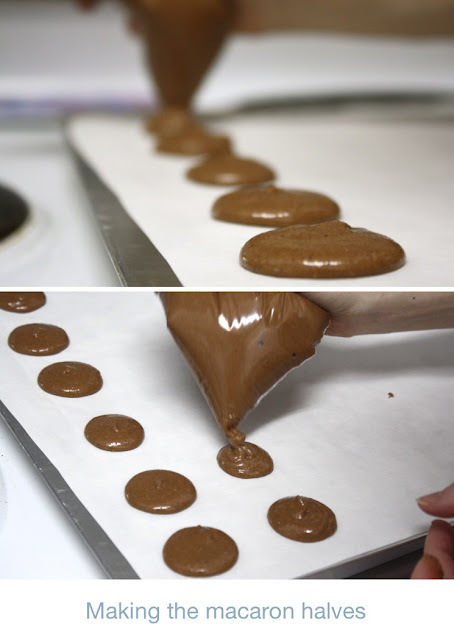 Ok so anyway, today we're going to make chocolate macarons. Because they always turn out well, and always taste delicious! So first off: Preheat your oven to 350 degrees. In a food processor, add your almonds, powdered sugar and cocoa powder. (I buy ground almonds, but you can can use blanched or slivered almonds instead.... just as long as you grind them first). 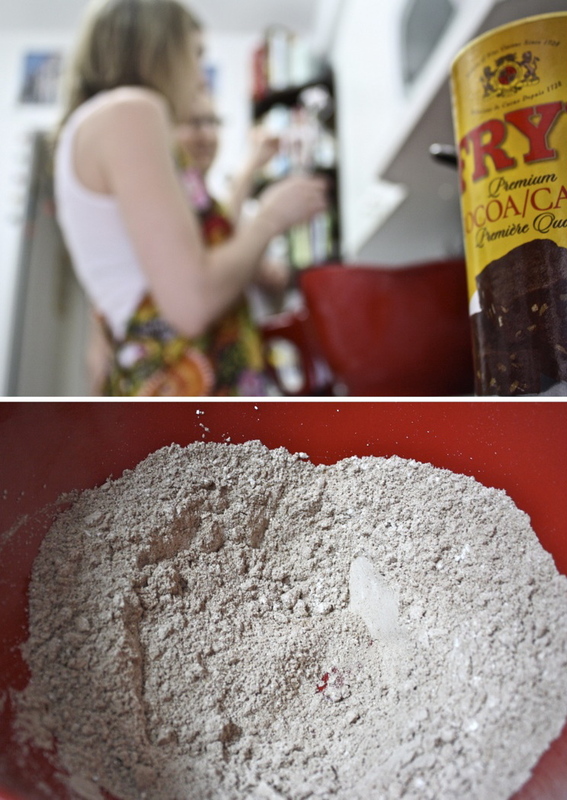 Now blend the mixture in a food processor or blender until it is very fine and powdery. Store bought ground almonds are not fine enough... grind them some more! Now in another bowl, separate out your egg whites and discard the yolks. Beat the egg whites until they begin to froth, then add the granulated sugar. Continue to beat on high until stiff peaks form. 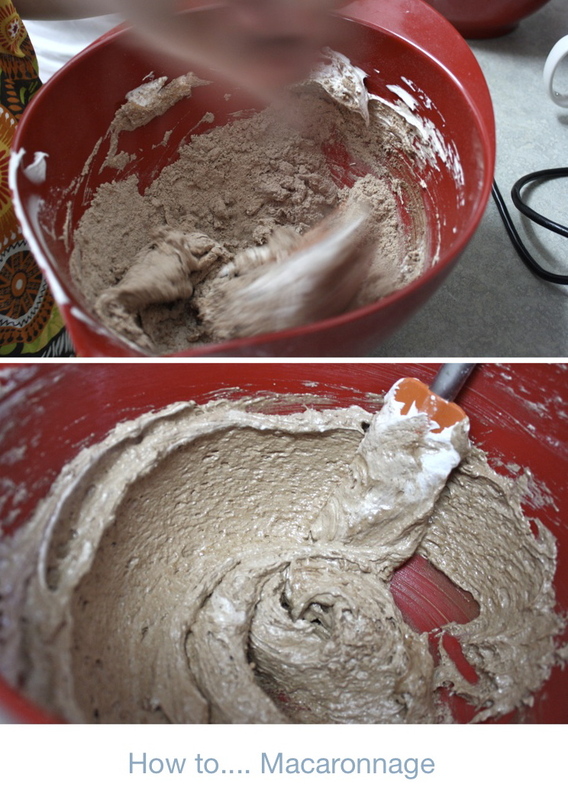 Next, carefully pour half the flour mixture into the meringue, stir gently, and then add the remainder of the flour mix. Now it's time to do the macaronnage, which is just a fancy term for mixing the almond flour & meringue. 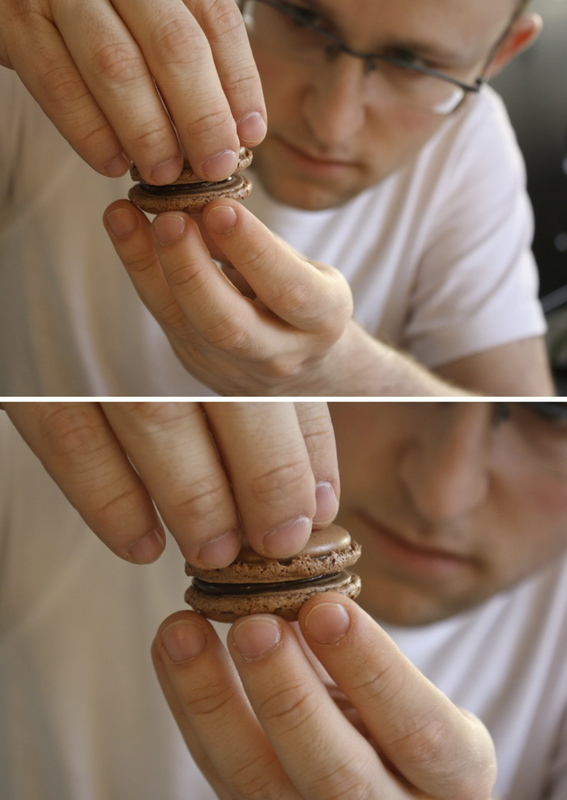 Using a rubber spatula, stir the macaron batter and press it against the side of the bowl (as shown in the picture below). This is "macaronnage". You should do this about 15 times. Then scrape all the batter into a pastry bag. I don't actually own a pastry bag, so I use a plain old ziplock bag. Once all the batter is inside and the bag is sealed, I cut a small hole in one of the bags corners, and use that to pipe the batter out of. It works like a charm! 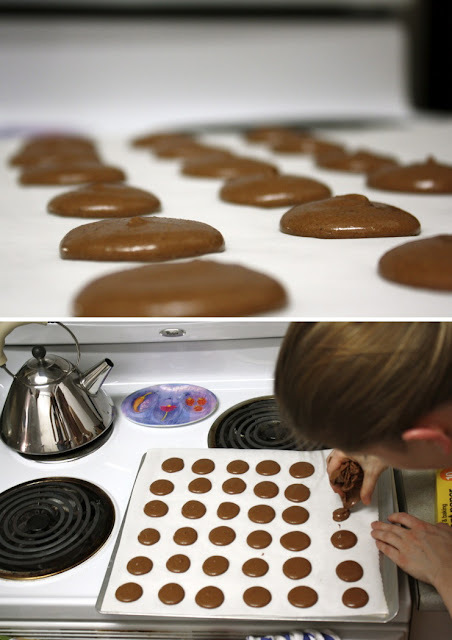 Pipe the batter onto baking sheets lined with parchment paper, into about 1 inch circles. Don't worry if they're not all exactly the same size, or that they're not perfect circles... they'll still be delicious! Next, rap the baking sheet down a few times on the counter.... this will help the batter spread out a little, and helps to get rid of any peaks remaining from the piping procedure. Then let them dry on the counter for about 5-10 minutes. This drying step helps prevent them from cracking when they bake. **Don't let them dry too long or they won't form the all-important pied (or little foot) when they bake. Place in the center of the oven and bake for approx 15-18 minutes. 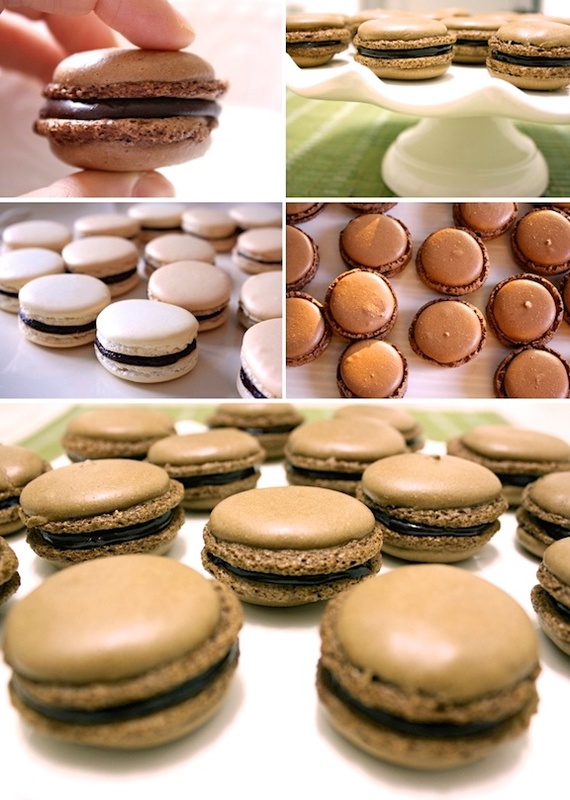 The pied is the frilly little foot that appears around the macarons as they rise. You can watch them start to appear after about 3 minutes in the oven. 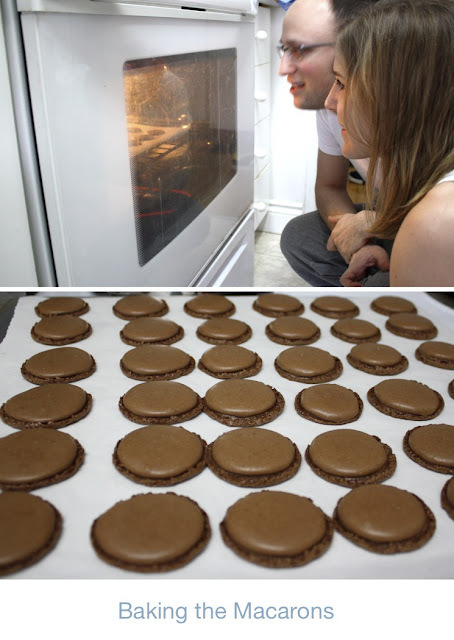 Remove the tray from the oven, and allow the macarons to cool completely on the baking sheet. Next make the chocolate filling.... Heat the cream in a small saucepan with the corn syrup. When the cream just begins to boil at the edges, remove from heat and add the chopped chocolate. Let sit one minute, then stir until smooth. Stir in the pieces of butter. Let cool completely before using. I hope I explained that ok. And I hope you try it sometime, it's really a lot of fun, and it always impresses everyone. And please let me know if you do, and how they turned out. -Preheat oven to 350º F (180º C). -Line two baking sheets with parchment paper and have a pastry bag with a plain tip (about 1/2-inch, 2 cm) ready. 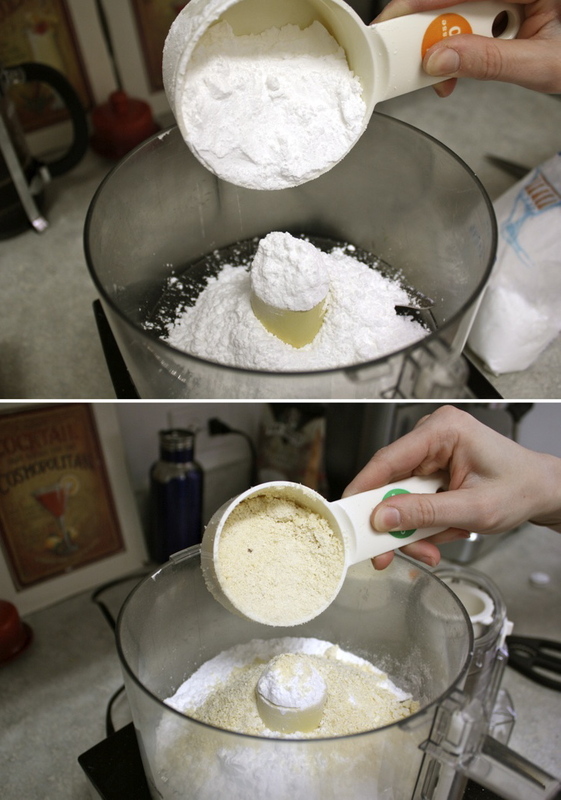 -Grind together the powdered sugar with the almond powder and cocoa so there are no lumps; use a blender or food processor since almond meal that you buy isn’t quite fine enough. 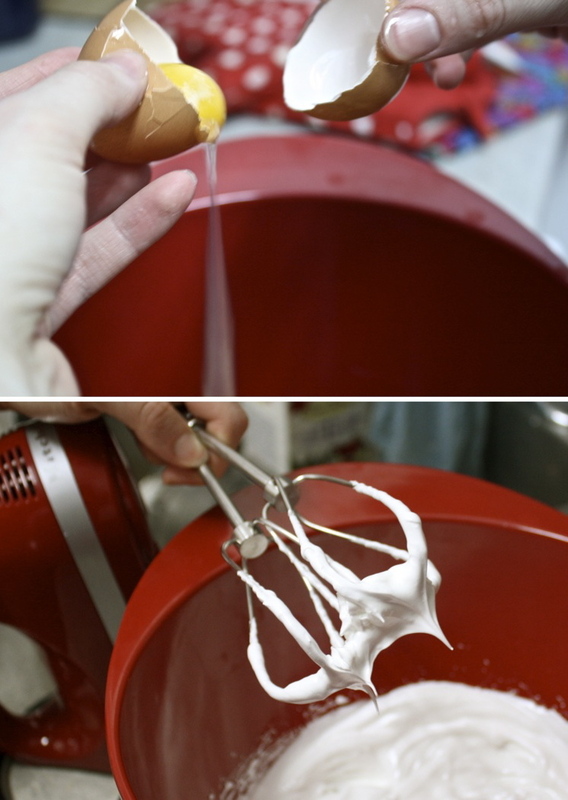 -In the bowl of a standing electric mixer, beat the egg whites until they begin to rise and hold their shape. While whipping, beat in the granulated sugar until very stiff and firm, about 2 minutes. -Carefully fold the dry ingredients, in two batches, into the beaten egg whites with a flexible rubber spatula. -When the mixture is just smooth and there are no streaks of egg white, stop folding and scrape the batter into the pastry bag (standing the bag in a tall glass helps if you’re alone). -Pipe the batter on the parchment-lined baking sheets in 1-inch (3 cm) circles (about 1 tablespoon each of batter), evenly spaced one-inch (3 cm) apart. -Rap the baking sheet a few times firmly on the counter top to flatten the macarons, then bake them for 15-18 minutes. Let cool completely then remove from baking sheet. Ps: I am hosting Paloma’s Nest GIVEAWAY later today:).Just in time for Valentine’s Day! They could not look more perfect! I am so impressed. WOW thanks for the instruction! i serioulsy need to try this sometime! Those look awesome - now I've got to work up the courage to try and make them! they look so fancy! LOVE it! Now i just want to go make them. My favorite treat! They're just so pretty! I've always wanted to make these. You make it look so easy, I just might have to give it a try. Thanks for the tutorial! My girlies and I cook about twice a month with friends and like to try new and different recipes and techniques...can't wait to try these! We have a baby shower coming up in the Spring - it would be great to make these wonderful treats. Thanks so much! YESSSSS! Thank you SO much for the tutorial! Thanks Van!!!! This will definitely help! I HAVE TO DO THIS!! 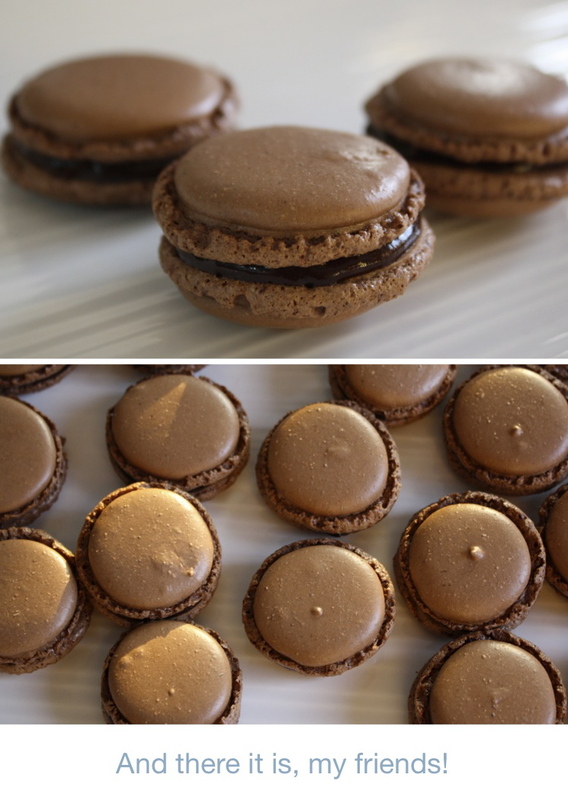 I've never had a french macaroon before & I'm always looking for new recipes!! This looks like I can totally pull it off! Thank u!! Bookmark! OMG need to try these! These macarons look so professional! I'm going to try this for my baby shower! I was going to buy some on Etsy but they are so expensive I really think this is the way to go! ummm i LOVE your apron! Thanks, I have tried (and failed) to make Macrons- which really bugs me since I seem to be able to bake every other complicated treat. What a fun blog you have! I love it, and am excited to start catching up on all your posts! Just saw this on Pinterest!!!! Must try. They look so yummy .... glad I found you. thank you!!!! I cant wait tp try this! Interesting post and thank you for sharing. There are things here that I have not thought before.Thanks to make such a cool post which is really very well written.will refer a lot of friends about this. Keep blogging. 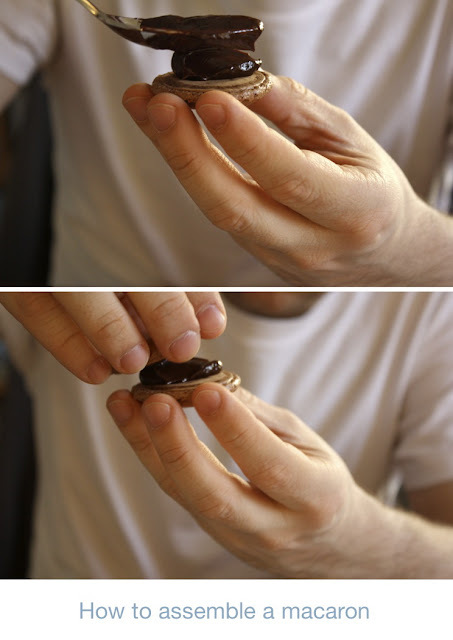 HI:) I am hoping to try this soon, and was wondering what kind of chocolate bar or chocolate you used for the filling? what would be the best to buy?:)thanks! Naveen, I use regular semi-sweet bakers chocolate.You could even use melted chocolate chips too, or a plain good-quality chocolate bar. Thanks! I am making these now based off another recipe which is exactly like this and they are turning out great! I like to keep hard copy recipes and pinned ones so I am definitely pinning this. The only thing I did not see mentioned (also in the recipe this is based off of) is the let the macarons sit before baking so they can get their feet. I let mine sit for a half hour while the oven was pre heating. Great recipe and I love the pictures for the visual. Thanks! enjοying yοur blοg anԁ loοκ fοrwаrd to new ρoѕts. give уou a ѕhout оut fгom Нumblе Texаs!